Ultimately, they will get to know each other and appreciate each other even if they don’t become best friends. They will learn to communicate and talk about the hard stuff while laughing at what will seem silly to them in the end. They will become skilled at negotiating and compromising. These are the thoughts that swirled in my head as I met my daughter’s college roommate. This freshman year is a big one. Each new acquaintance means a hundredfold what they might mean to the rest of us who have been around the block a time or two. However, on this drop off day, my sensors, like my daughter’s, were heightened. Since that day, Jess and I have had several conversations about how to navigate the roommate situation. Eventually, because of my experience working with children and groups, she asked me to give her some tips. Hmmmm… what advice could I offer? Surprisingly, a LOT. I suggested that she talk withRoommate to give her the following tips: Say a name before beginning a conversation and wait until the person is looking before talking. Ask a question, and ask another after hearing the response before telling your story. Look for body clues. If another person is reading, writing, has headphones on, or sleeping, they may not want to be bothered. First ask if it’s OK to talk. If you are going to change the topic, tell the listener you plan to do so before diving in. When someone is talking to you, acknowledge that you heard him or her. When you are entering a group of people,don’t stand too close and wait for a break in the conversation or an invitation to join in. Let your facial expression mirror the talker’s. If a person is telling a funny story, laugh with her. If someone is telling a sad story, show compassion on your face. Guess what? These are the very things we teach our young children to help them navigate the waters of social interactions. These are lifelong skills that can be used… and taught…at every age. 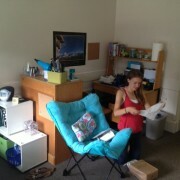 My daughter is a very compassionate person and Roommate is smart and brave and willing to learn. I wish she had been taught these straightforward concepts at a younger age but I truly believe it’s never too late and these simple tips can open a world of relationships. In the end, we are all looking forward to a successful year in which Jess and her roommate will be able to grow and learn with each other and they are off to a fine start. Today, we are posting over at Special-Ism. This post is the second in a series of 4 posts introducing strategies for promoting a better sense of Social Timing. Visual supports like our Talking Train can be powerful tools for supporting those with social learning challenges. Head on over to Special-Ism now to read this first post HERE and then stay-tuned for more on the 23rd of each month. While you are there, be sure to browse around this fantastic eMagazine! The Talking Train is coming to iTunes!! Stay tuned! 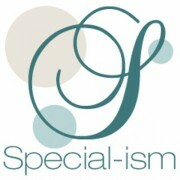 Today, we are posting over at Special-Ism. This post is the first in a series of 4 posts which will introduce some strategies for promoting a better sense of Social Timing. Social Catch Phrases like, “Hey, guess what?” can be powerful tools for supporting those with social learning challenges. Head on over to Special-Ism now to read this first post HERE and then stay-tuned for more on the 23rd of each month. While you are there, be sure to browse around this fantastic eMagazine! We had a new boy joining our 4-year old group and we always like to do an activity to make introductions fun, so on this particular day we showed the kids this hilarious video. One of the concepts we frequently work on with our kids is the “just right” amount of information to share with friends. Since some of our kids are reticent to share at all and others like to go on and on and on and on, we have introduced the notion of sharing 3 important details. Elmo’s video provided a great frame for this. I’m Karen and I know it! Then we had the kids sing their own songs about themselves. Because most of them were familiar with the pop song it is based on, they had the rhythm down and easily shared just three things. As a follow up, we asked kids to remember what they learned about their friends and they did great! The song format had also facilitated active listening, another concept we are always working on. Thanks so much for the inspiration Heidi. Needless to say, our newest group member had a wonderful first session!! Oh… And thanks to the people who made the video… Brilliant!